Congratulations to Brian who chalked up another impressive win in this past weekend's Person-of-Mystery Contest. He correctly identified John Studebaker as the unidentified person in the photo. Last week, our family was vacationing in the Lake Tahoe area. It was a wonderful time of getting away, turning off the phones and e-mail, and just hanging out as a family. My wife is from Wisconsin, so each year she likes to take the family somewhere to see the snow. Christmas was rather snow free for us here in California, so we had to wait until Spring Break. We don't usually go all the way up to Tahoe (it's about a 7 hour drive for us), so when I get to go up there, I also like to take in the history sites (if my family will indulge me). I love Northern California as it combines two great loves of mine – the outdoors and history. Jonathan, our youngest son, became rather interested in the mining history of Northern California, so we went on a couple of abandoned mine tours. On the way home, we stopped off at Placerville, California. 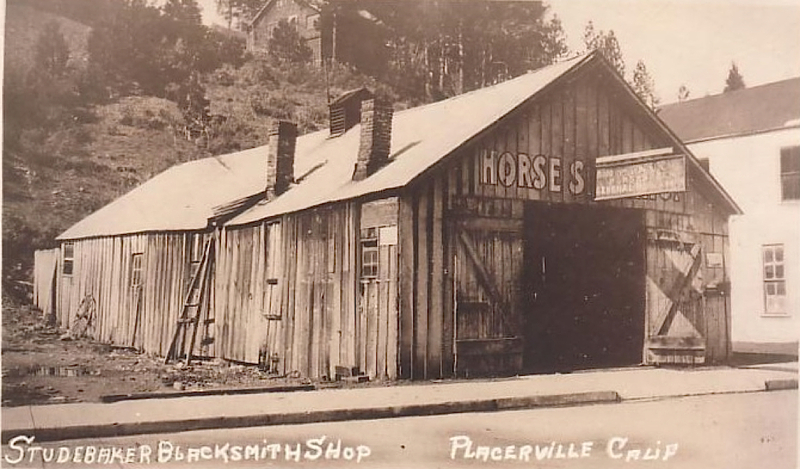 Placerville was one of the early gold-rush towns and had a number of colorful names in the those days. It has alternatively been known as "Blood and Guts," "Dry Diggins," and for a number of years as "Hangtown." 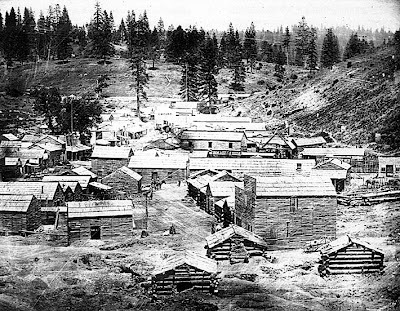 Many an adventurous forty-niner came to California looking to strike it rich, more often than not, returning home just as poor and worse for wear. John Studebaker was one of those who went West to find his fortune. At age 19, his blacksmithing brothers had made him a wagon, and John left with $65 sewed into a belt, three changes of clothes and a Bible. John arrived with a wagon train in the Fall of 1853. Immediately upon arrival in Hangtown, the new comers were approached by the townsfolk asking for word from the outside world. In the commotion a local blacksmith, Joe Hinds, asked if there were any among the newly arrived who was a wagon maker. Studebaker responded that he was and Hinds offered him a job on the spot making wheelbarrows. Studebaker politely declined saying he was there to look for gold, but a stranger from the town came up and offered John some advice, "Young man, take that job and take it quick!" He added that there'd be plenty of time to look for gold later, but jobs were scarce. John ran after Mr. Hinds and told him he'd changed his mind. 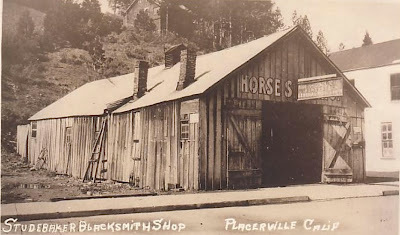 Hind's Blacksmith Shop in Hangtown (later Placerville). Johnny made wheelbarrows towards the rear of this building. 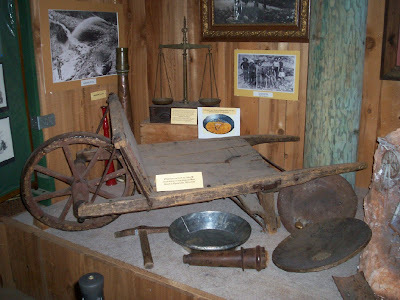 For the next several years, John (now known as Wheelbarrow Johnny) made wheelbarrows for the miners working in Hangtown and was paid $10 per unit by Mr. Hinds. He worked hard and saved his money. 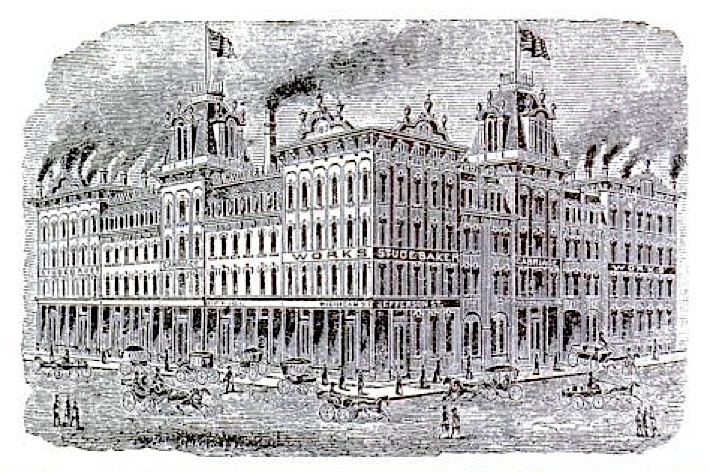 At one point he heard rumor that Adams Express Company, where he had deposited his money was in financial trouble, so he watched their building until he noticed men entering from the back side. The company officials were loading the gold into a wheelbarrow and were about to leave when John held them at gunpoint and demanded his $3,000 he had on deposit with them. 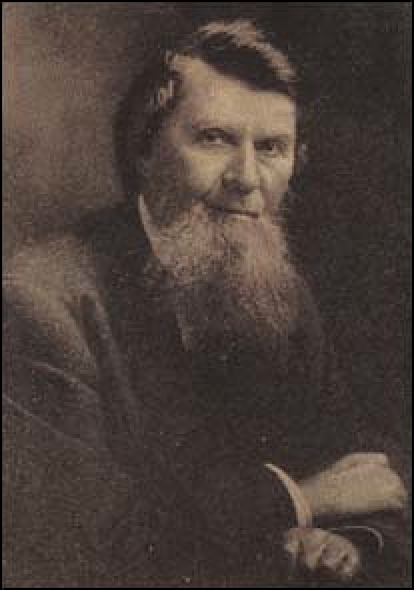 The company failed, but John kept his fortune and by 1858 he had saved $8,000. His brothers back in Indiana kept in written contact and told him that their wagon business was starting to take off, but needed capital. John returned to South Bend, Indiana and with the increased production, the Studebaker Company lowered cost and increased demand. 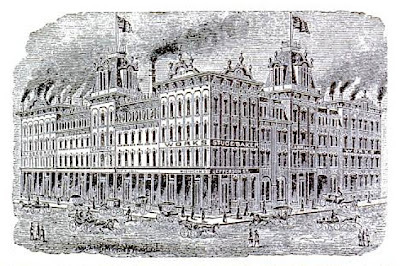 The Union Army purchased a large number of ammunition wagons from the Studebakers during the Civil War and the company continued to grow, becoming the best known wagon maker during the 1800s. Evenually, Studebaker would start producing automobiles and would continue producing cars until the mid-1960s. John acted as president of the Studebaker Company and outlived his brothers, remaining as honorary president until his death in 1917. However in 1912, a five years before his death, Wheelbarrow Johnny returned to Placerville (Old Hangtown) to a warm welcome from its citizens. They decorated the town with flowers and hung signs that read, "We're glad you're back." John stayed up late reminiscing with his friends and had a grand time. 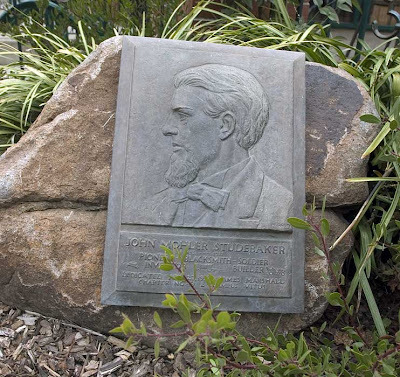 Studebaker Marker at 543 Main Street in Placerville, California, the former site where John made wheelbarrows. Today it's a Starbucks Coffee Shop. Since 1939, the El Dorado County Fair in Placerville has held the John M. Studebaker International Wheelbarrow races in his honor. Very interesting. I liked how you tied it in to your family vacation. My grandfather always drove Studebakers. My brother even had a Silver Hawk, wow that was a fast car. We had 2 Studebaker pick-up trucks on our farm and business. Known about the cars but not of the history behind the company. My grandfather owned Studebakers also. 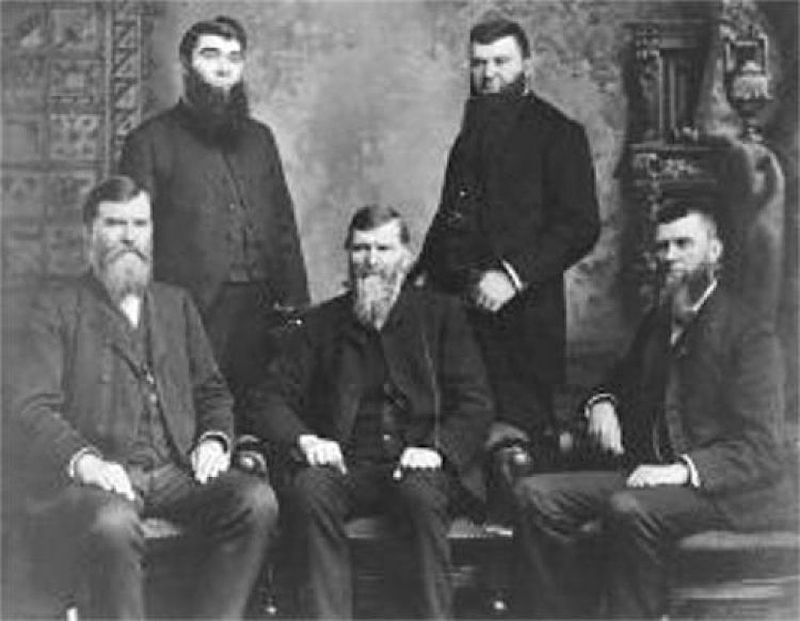 Apparently they also founded the 'men with large beards' society. JM is my relative, and I can say many Studebakers are resourceful, common sense people. Thanks for sharing. Very informative post Wheelbarrow. Also, Wheelbarrow it is very useful for work.